Summer is approaching quickly. Tourists are already competing with the local xábianeros for sun beds on the beaches of Jávea. Restaurants have their new delicious summer cuisine ready to be served and the sun is shining from a clear blue sky on the beaches of Costa Blanca. Javea is understandably irresistible when viewed from a rainy day in Birmingham, having just woken up to a frozen car window in Stockholm or another gray morning in Hamburg. But. Don´t just book the first villa on offering or holiday apartment in Jávea you come across without doing a bit of research first, some areas will suit you perfectly whilst others may not. 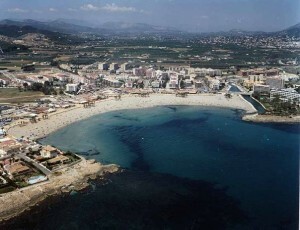 The Arenal area is the entire part of town surrounding the main sandy beach and tourist facilities in Javea. It is primary made up of apartments of varying quality in relatively low builds of up to four stories. Finding a villa for rent on the arenal itself is next to impossible, though there are plenty in adjoining areas. Choose an apartment rental on the arenal or in Javea park if vicinity to the beach and walking distance to all amenities are your main priorities. Speaking only English wont be a problem in an apartment on the arenal as the area is overwhelmingly geared towards English expats and tourists from around the world. Most vacation apartments on the arenal come equipped with air condition, access to a pool and lifts if above ground level. However, apartments in older blocks may be missing one or more of these rather necessary features, so inquire in advance. Further, get the apartments specific location as some advertise “walking distance to the beach” or “Arenal Beach Javea” when in fact it is placed further away in one of the less attractive and commutable areas. 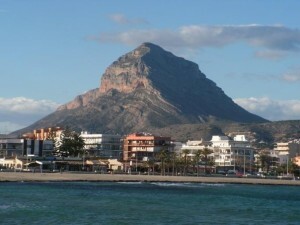 One thing is always in sight in the Javea valley, the mountain Montgo that characteristically raises its peak up in the sky above Xábia. Holiday villas on Montgo are plentiful and generally of a very high standard, whereas you will struggle to find apartments as there are basically next to none in the mountainous terrain above Jávea. The villas on Montgo are located in urbanizations forming a ring round the mountain from Denia, round to Javea and out towards the Montgo national park and the Cap de Sant Antoni lighthouse. The rentals on Montgo come in all sizes and shapes, but tend to be towards the luxurious and expensive end of the market, specially if they are in a location with sea views. As always, get a specific location for the villa you are interested in. On Montgo you will always have a stunning backdrop from the mountain and a view across the valley or the sea – but if sea view is important to you, you need to know the exact spot as several of the urbanizations on Montgo face inlands. Vacations with Montgo as a base require a car for the duration of your stay as you will be in steep terrain and outside of walking area to any of the beaches, shops or restaurants. It is however a short 5-10min drive downtown and to the beach. 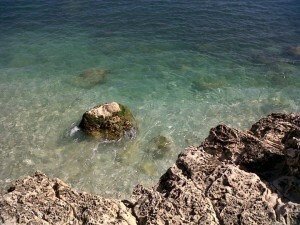 One of the most stunningly beautiful scenic views in the Jávea area is found at Cabo De La Nao. From the tall cliffs high above the sea you can admire a wild and impressive coast line in a terrain so wondrous it has to be experienced. 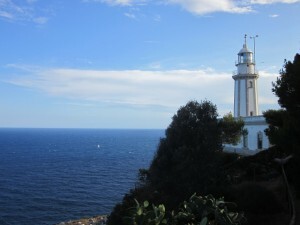 Up on the Cabo De La Nao itself you find restaurants hanging on the mountain sides high above the water, viewing points in unspoiled areas of unequaled natural beauty and a good selection of shops and bars nearby. The villas in the area are rather spread out around the main viewing points and coast roads though, so far from all villas are in easy walking distance to the Cabo De La Nao itself or have sea view for that matter. Ask the landlord or agent for the exact features of the villa you intend to rent to make sure. 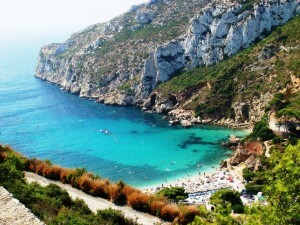 As if the options mentioned above weren’t spectacular enough Javea has a true gem for lovers of amazing scenery, undisturbed beauty of nature and the Mediterranean at its most charming. The Granadella cove features a small beach with restaurants and a bar surrounding a pebble beach, but the characteristic of Granadella is the sense of almost devine beauty. Grenadella is partly cut off from the rest of the Javeá area and only accessible through a narrow little mountain road doing hairpins through the isolated mountain sides down towards the beach. Obviously, that means Granadella is highly inconvenient if you require easy access to the main amenities, nightclubs or shopping facilities in the area. Granadella offers rather the opposite – tranquility in the middle of the most stunning scenery possible. Holiday rentals at Granadella beach can be slightly harder to find than in other parts of Xábia, but there are excellent villas and a few townhouses that will cater nicely for a breakaway full of pleasant experiences in one of the most beautiful locatons in Spain. One of the popular areas for holiday villa rentals in Javea is Portitxol with the main feature being a small enclosed beach looking out upon the Portitxol Island. The beach itself has few services, but there is a sea side restaurant serving excellent tapas hidden behind a rock by the beach. Further the Portitxol area is ideal for long walks in undisturbed nature with its woodlands and stunning sea side scenery. The area is quiet and pleasant for peaceful family holidays in lovely surroundings and within easy driving distance to the bars and restaurants on the Arenal. As always – take your time and find the perfect spot for your holiday in Spain. There are several more excellent areas of Javea offering apartment, townhouse, finca or villa rentals for your breakaway – and we will get to them soon! 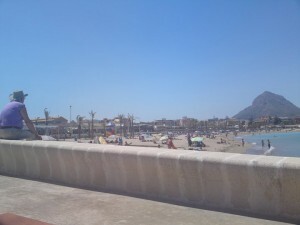 This entry was posted in Costa Blanca News, Holiday In Spain, Javea-Xabia, Villa In Javea and tagged Cap de Sant Antoni, Holiday Lets, holiday rentals Jávea, Jávea, javea spain, móntgo javea, villas on montgo. Bookmark the permalink.